Lately I have been contemplating the nature of friendship: authentic friendship. I have lived all over. Being a Veteran, I have meet a lot of different people from all over, including from my time in England. I have discovered over the years that the majority of friendships are tied to circumstances. Those friendships seem to be a necessity. It is a, “We are all in this together”, type of situation. That is very true in the military. I can honestly say that I have only had a handful of real and long lasting friendships. As I thought about this topic, one thing struck me about those friendships: They all encompassed the Cross. Those friendships that have had the greatest depth were when the two of us went head long into the depths of pain and suffering. There was no fear, worry, or pride. We may not have even been able to understand fully the other person’s pain, but we walked together no matter what. I think the first time I realized this was about 9 years ago when I was living in England. I had been diagnosed with delayed-onset PTSD from my 9-11 relief work and ended up checking myself into a hospital for inpatient treatment. My friend, Nicky (who I hope reads this. Your birthday pressie is in the mail!!! ), took over my affairs and she would drive down to London, nearly a 6 hour drive once or twice a week to visit me. She came after work, she came on weekends, it did not matter. In the month that I was there, she was always there for me. She is a British civilian. She did not know exactly what I was going through. That scared a lot of people, but not her. She loved me and stayed with me through the whole thing. Real friendship requires vulnerability. A willingness to let go of the masks we wear out of pride, and let others see us as we are: works in progress by the grace of Christ. Friendship, just like any other loving relationship, requires great courage. Pain causes fear. In our sin, our natural inclination is to run from pain, but friendship means running head long into it. It means spending the day with someone whose anxiety is off the charts after successive miscarriages. Or hugging someone who is crying in agony. It means listening to another person’s heart as they bear all that they carry. It means forgiving and moving forward, when disagreements occur. Friendship is a great gift that God gives us along the journey. How wonderful it is to meet someone and say, “Me too!”. It is a chance to move past the mundane and superficiality of our daily lives. There is a deep longing in our hearts to know people as they are, but sin cuts us off from each other. 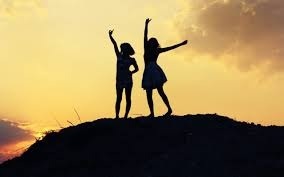 Friendship is a foretaste of Heaven, where superficiality is left behind and we see people transfigured in the brilliance of Christ, where we are made whole. With all of this in mind, I would challenge all of us, to go deeper into friendship. To conquer fear and misunderstanding. Friendship does not always require empathy; sympathy is enough. It does require summoning our courage as we go deeper into Love. It means serving, even when we are busy with everything else. Just like family, friendship means prioritizing. Are there friendships in your life that may have grown stagnant? Do you keep people at arms length at times, like I do? How can we better serve the people in our lives, as Christ calls us? Do you desire deeper friendships? Friendship is a great blessing. Let’s let those people bless our lives fully. God bless.